How to generate a .ang file with TSL-OIM software ? 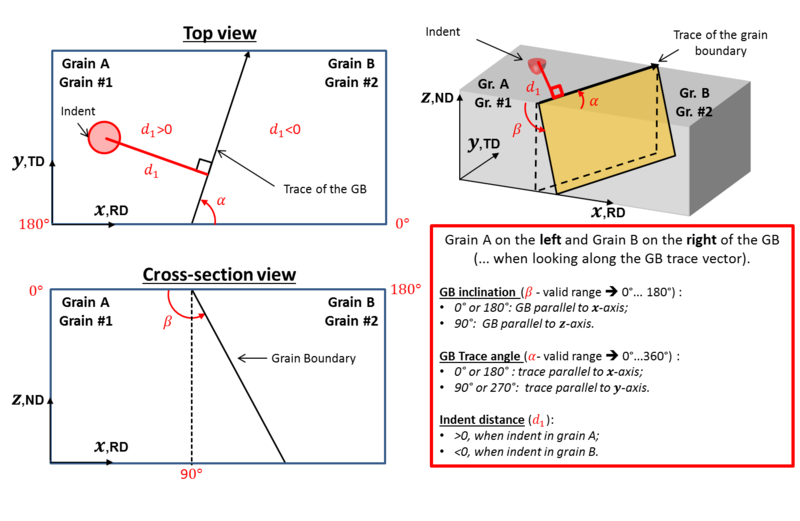 geometry of grain boundaries (trace angle and grain boundary inclination) (optional). TEM experiments can provide intragranular misorientation and EBSD measurements can provide average grain orientations, grains boundaries and grains positions, and grain boundary trace angle. Inclination of the grain boundary can be evaluated by serial polishing or focused ion beam (FIB) sectioning, either parallel or perpendicular to the surface of the sample. Open you .osc (or your .ctf) file in the TSL-OIM Analysis Software. Set the TSL coordinates system ! Change data properties for the detection of grain boundaries (All data –> Properties). Clean up your dataset (Filename –> Cleanup). IDs of right hand and left hand grains. Reconstructed boundary methodology is only applied to data collected on a hexagonal grid. Nevertheless, it is possible to convert a square grid into an hexagonal grid in TSL-OIM software. It is not possible to export a “Reconstructed Boundaries File”, containing “opened” grain boundaries. decrease/increase the maximum deviation between reconstructed boundary and corresponding boundary segments. Diameter of the grain in microns (optional). Export the “Grain File Type 2” in the same location as the corresponding “Reconstructed Boundary File”. It is possible to load other type of EBSD data files (e.g. : .ctf files), using the ‘import_wizard’ of the MTEX toolbox. First, download and install the MTEX Toolbox. Then, import your EBSD data (e.g. : .ang file) and set the coordinate systme, using the ‘import_wizard’ and save the EBSD dataset in the Matlab workspace as a variable named ‘ebsd’, and press ‘Finish’. The EBSD map is automatically plotted from the imported data. The coordinate system and the scan unit are set from the properties of the imported data. For a single phase material, the phase number is 0 or 1. For a two phases material, the phase numbers are respectively 1 and 2. For non-indexed pixels, the phase is numbered as -1. Export “Scan Data (.ang file)” of the cleaned dataset (Filename –> Export –> Scan Data) (optional). Example of an .ang file. Solved when file is imported via the GUI. Cross product performed between GB vector and center of grains to check (if cross product < 0 : no inversion, and if cross product > 0 : inversion). \(y\) coordinates is multiplied by -1 when file is imported via the GUI. All of these issues are taken into account and corrected automatically when user is loading his data via the EBSD map GUI. Figure 12 Screenshot of the EBSD map GUI with a problem of axis limits. In this case, it is advised to use the ‘zoom’ function of Matlab to zoom in and zoom out in the center of the EBSD map, to vizualize the grains. 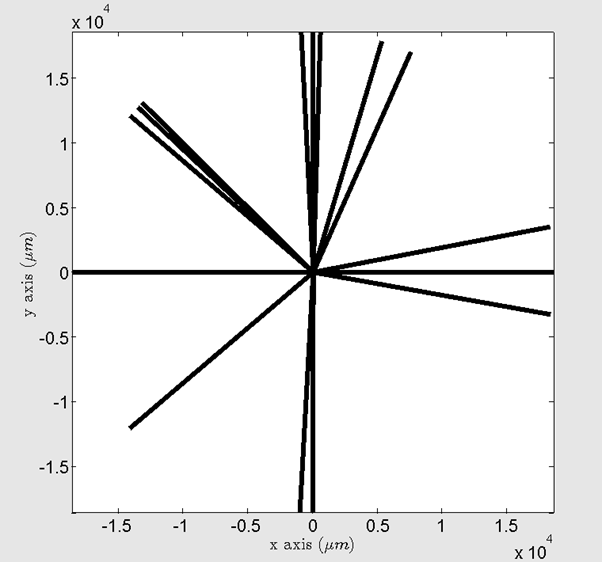 It is also possible to set directly the limits of axis (e.g. : xlim([0 1500]); ylim([-1000 0]);) in the command window of Matlab. The YAML configuration file provides a simple way to define a bicrystal. Copy this example file and modify it with your data. Be careful to put a space after the comma in a list (e.g. [\(x\), \(y\), \(z\)]). Don’t change fieldnames and don’t round Euler angles. Euler angles are given in degrees. Load your YAML bicrystal configuration file via the menu in the bicrystal GUI. You may have to run again the path_management.m Matlab function, if your YAML bicrystal configuration file is not found by Matlab. Visit the YAML website for more informations. Visit the YAML code for Matlab. Figure 13 Geometrical convention of a bicrystal.